A calendar which precedes the other texts includes the dedication of the church of St. Lawrence, Ludlow (the largest parish church in Shropshire); the manuscript was undoubtedly made for use in the parish. It contains a variety of texts, all in French but not all religious--one concerns how a lord or lady show manage their estates, another gives rules for ensuring love and friendship-- which suggests that the book may was owned by a wealthy layperson, rather than a cleric. 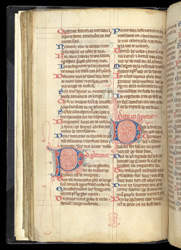 Psalms 50 and 51 are marked by enlarged 'puzzle' initials in red and blue, filled with red flourishing. Each Psalm has the first few words written in red in Latin, followed by the psalm in full in French.